I have used my interviews with hundreds of real Guernsey evacuees to create this 1940 Guernsey Evacuee Mother’s diary below. 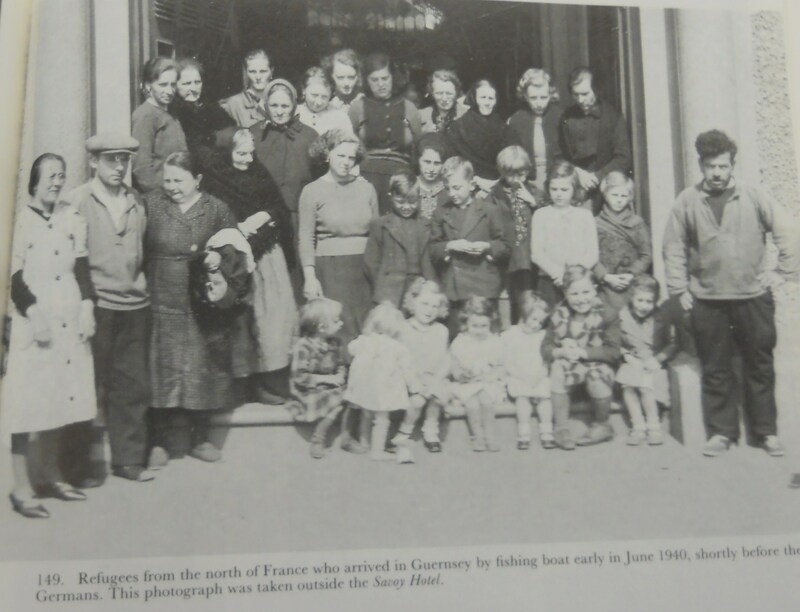 It highlights some of the real experiences Guernsey’s 17,000 adult and child evacuees went through during 1940, in their evacuation to mainland Britain. I recently updated this diary with real images relating to the Guernsey evacuation. Last night my family and I in Guernsey could clearly hear the guns on the French coast, just 30 miles away. My husband fears the Nazis will invade Guernsey, but I am not so sure, there is confusion all around. Heard the French guns again last night. My sister called round this morning, she teaches at the college, and thinks that we might get invaded and that the children might get sent to England. I cant imagine it, sending my two little ones away. Trying to remain calm. Jean next door is packing up and going to stay with her sister in law in England, she is terrified at the possibility of invasion. She said she will come back in a few weeks if things calm down. The noise from France seemed louder last night, we wondered if the Germans are near Cherbourg! As we ate dinner, the plates were rattling on our dresser. This morning my daughter saw a small aircraft fly low over St Peter Port. She saw the pilot distinctly, but unfortunately not the ‘plane’s markings. But she is sure it was German. Had a sleepless night – my brother in law works at the telephone exchange and he overheard conversations from islanders who are planning to leave for England soon, some by plane. My husband John said that he would find it hard to leave our family farm and home to the Germans. Went to St Peter Port today, and discovered that holiday visitors are still arriving in Guernsey! ! It was a lovely sunny day and everything looked so normal. Our neighbours Joe and Ann are leaving for England today, Joe was born in England and says he ‘doesn’t fancy his chances’ if the Germans arrive in Guernsey. Its caused a bit of a stir on our road, and I am feeling very unsettled again today. There are explosions in Cherbourg today, it is quite frightening, the Germans must have reached the French coast. I looked around my home this morning and thought to myself “what could I take with me if we had to leave suddenly?! John just heard that two boat loads of refugees from Cherbourg arrived in our harbour today. With them was a British soldier who is of the opinion that the Germans might cross the water to the Channel Islands. Dear God! The ‘Guernsey Star’ paper says that the schools are being evacuated to England tomorrow! We have until 7pm tonight to decide what to do, I cannot stop crying. Waiting for John to get home. No sleep at all, argued all last night with John, but he insists I leave with our children accompanying the Forest School group, and he will stay behind with our parents and the farm. I will miss him so much! Have packed a small bag, and said goodbye to Mum and Dad, cant believe this is happening. Taking diary with me but not sure when I will have chance to write in it over the next few days. Poor Guernsey! We waited for hours at the harbour, but no boats came to collect us, eventually we had to send the children home to their parents. No doubt it will be a shock to them to have their children walk through the door unnanounced. We will regroup tomorrow. We all gathered at the harbour to be evacuated, and a number of pupils who were present yesterday did not appear today. 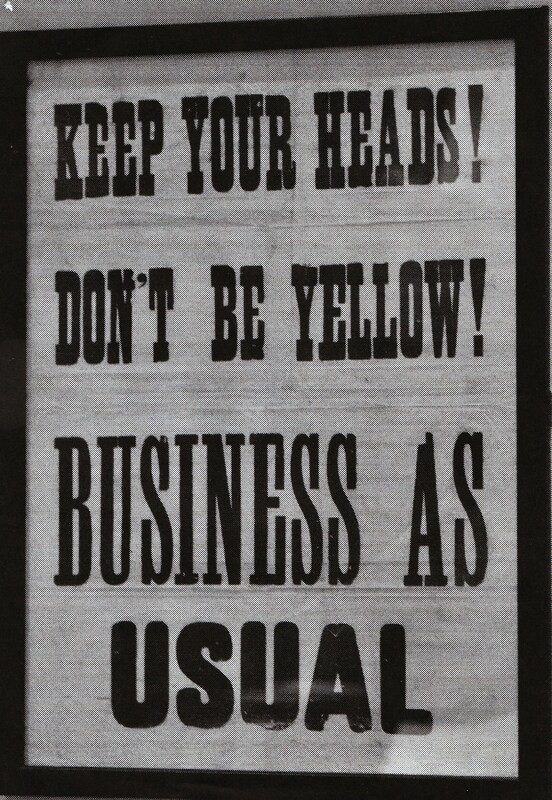 I was very upset when I saw posters which said ‘Dont Evacuate, Don’t be Yellow’ – it made me feel as if I was a coward of some kind. At last we boarded a ship! After a never ending journey over the sea to Weymouth (where we were examined for head lice!) we spent 12 hours crammed onto a steam train. Our school group arrived in Stockport at 5.30am, and were taken to the Masonic Hall where rows of camp beds awaited us. How strange it is in this evacuation reception centre! There is no privacy whatsoever. Our camp bed is our new ‘home’- it is bed, chair, table, dining room and wardrobe! Rested during the day as much as we could. I am feeling very far from home but the volunteers here are so kind. We adults were taken out for a walk this morning, whilst kind volunteers looked after our children. The Masonic Hall is on a very wide busy road, much wider than any road in Guernsey! And there are chimneys in the distance billowing black smoke into the air, and huge buses, with two decks are going along the road! It is like another world! Some local children invited our pupils into their school hall today, to play games. It brought a smile to the faces of many of them, who are wondering where their parents are. No news from Guernsey as yet, and we have no idea how long we will stay here at the Masonic Hall. Everyone is being so kind to us. Missing my dear husband terribly. My Joan and David have been so good throughout all of this, but Joan was missing her father last night, as were lots of the other pupils. One of the volunteers gave me writing paper and a stamp, so I wrote a short letter to John this morning, telling him where we are, although I don’t know how long we will stay here at the Masonic Hall. What excitement for our school children today! 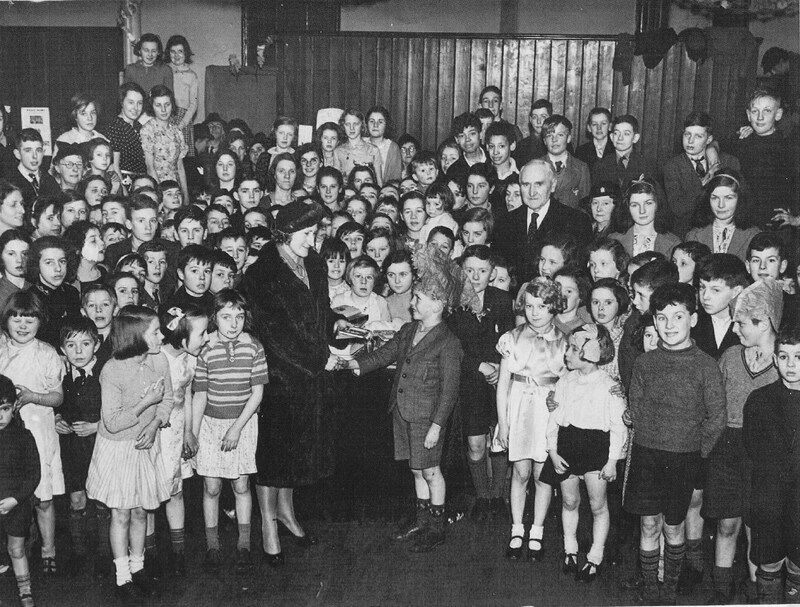 Books and toys began to flood into the Masonic Hall, given by children and adults in the local area. The smiles on the faces of the children really was a sight to see! Our Headmaster Mr Martel took us all on a walk today into the town centre, we formed a long crocodile along the pavement and people stopped as we passed to say hello. Everything is so very different here to our Guernsey home. No one has yet received any news from home, and there was no news about Guernsey on the radio today. Volunteers brought clothes into the Masonic Hall for the adults today, it was lovely to change into something clean. One lady said to me “Did you not bring your clothes and furniture with you?” I explained that we had travelled on a crowded evacuation ship, with just one small bag each! Mrs Povain arrived today, she went to a place called Burnley first, then came here to find her daughter who is with our school party. She said that in Burnley, an official started speaking French to her when she arrived! She was very offended and told them that she speaks English, and is loyal to the King! This morning we all walked into Stockport and queued up to obtain new ration books. Then we heard some horrific news on the radio – Guernsey was bombed by the Nazis yesterday! 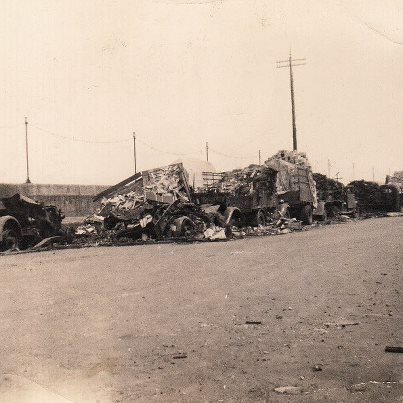 There were tomato lorries lined up at the harbour which were also bombed. The drivers had climbed underneath their lorries for safety so they died when the petrol tanks exploded. Others died too. Are our families and friends still alive? Mr Martel has sent a telegram to the Education Department in Guernsey to ascertain news for us all! We had our first air raid last night, we had to drag all the children out of their beds, the tiny ones were crying, and some ran under the stairs to hide. We were in the shelter for 90 minutes. We couldn’t get some of the children back to sleep afterwards. Still no news from Guernsey today. Dreadful news received! The wireless notified us that the Channel Islands have been occupied by the Nazis and all communications cut. Now we are completely cut off from home, and what we all dreaded has happened. We teachers and mothers have spent all of today comforting the children, who do now know whether their parents are alive or dead. We will talk about our own fears when the children are asleep tonight. Through an oversight, officials started to billet our our pupils at 10am today! we managed to stop this at 11am but a third of the children had already been taken away by local families! The council have promised that they will be returned to us in two days time when we are all going to be moved elsewhere. Two letters arrived from Guernsey, posted before the bombing and occupation, are the writers still alive?! Our Headmaster just heard that we mothers, teachers and pupils can stay together as a school unit for the time being. We are being transferred to a village called Cheadle Hulme in a couple of days time. That is some relief for us all and we can take care of each other until we can all return home to Guernsey once more. We were so busy yesterday that no time to write my diary. We all paid a visit to the public baths. Despite our worries, it was lovely to get really nice and clean. Our daily rations are: Breakfast – boiled eggs and bread and margarine, Lunch – meat and lettuce with bread and marg, Tea – bread and marg with jam, and sometimes a piece of cake! Tomorrow we are all going to Cheadle Hulme as a school unit, so will pack our few belongings tonight for an early start. 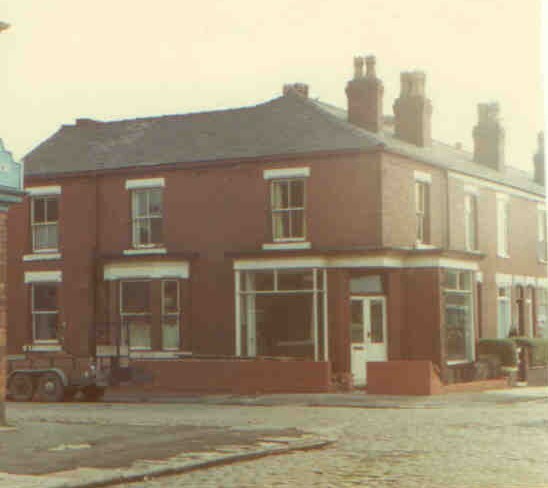 We went by train to Cheadle Hulme but when we got there, everything seemed to go topsy turvy … my own children, Joan and David, vanished and were billeted out separately … I had left my husband behind on Guernsey.. it was too much for me to bear! I went to find our Headmaster and explained to him how I felt. The officials found David and Joan and returned them to me that evening.. then an elderly lady who had apparently refused to take anyone in earlier that day saw me, took pity and said she would have us all. Bill was separated from his mother when billeting first took place, They were reunited later. We had not been asleep long last night in our new home when the air raid siren sounded. None of the lights seemed to work in the house, I found some matches but then set fire to the box of matches and burnt my fingers. The children and I walked down the stairs, clutching each other, in the dark to the cellar – they were very frightened. There for about an hour, then the all clear sounded, so back to bed. We were given a lift into the city to look at the shops, although we have little money. I gazed at the huge Town Hall in amazement – I couldn’t believe how a building could get as black as that. How many tons of coal have coated this city with soot?! A bad day, some of the evacuee children had to go to hospital with infectious diseases, and one has blood poisoning, due to a cut on her leg during the evacuation which she did not mention until this morning. Today and tomorrow, we are helping the Headmaster and teachers to look at all the billets that have been provided to the school children who left their parents in Guernsey. I don’t think I will have much time to spare for diary writing for the next day or two! Exhausted from walking around the neighbourhood again today inspecting billets for all the children. But its good to see who they will be living with and what conditions are like in the homes. We walked miles for two days, checking every child’s billet, to see what the house was like and to talk to the family who would be caring for the children whose parents are still in Guernsey. Rewarding but exhausting so resting today! I am lucky that I have my children with me. Heard that our Guernsey school can operate from the local church hall, we went around the local schools asking for spare books and equipment as we have nothing. They were very generous so we will manage with what they have given us. I have to say how wonderful the headmaster and teachers have been with all the children whose parents are left behind, they treat them as if they were their own. Our new school opens next week, we mothers, pupils and teachers have to clean the premises first. Scrubbed and cleaned until my hands were sore yesterday, the children swept and dusted and carried in the books and equipment that we have been given. Most seem to be happy in their new billets. I wonder how my dear husband John is faring in Guernsey under the Nazis? Our Guernsey school opened today so I sent my children there for the first time since our arrival in England. Visited a few Guernsey ladies to talk about home and shed a few tears over cups of tea. It is much colder here and we are short of clothes but cannot afford any. Will speak to the Headmaster soon. Have realised that I just cannot manage financially as things stand so will endeavour to find some sort of employment. Will need to ask another Guernsey mother to help me with the children perhaps, depending on the hours I work. My dear husband would be shocked to think of me working outside the home! I spent most of today walking around Stockport looking for employment. One man said ‘I don’t recognise your accent. Where are you from?’ And I said ‘Guernsey’ in the Channel Islands . He said ‘Blimey I thought you would be wearing a grass skirt!’ Most have no idea where Guernsey is but were very friendly. A woman at the cinema was very sympathetic about my husband who she described as being “stuck with them flaming Nazis”. She thinks there may be some work so I will call there again in a day or two. Met a nice local woman whilst shopping today who asked me how I liked Stockport town centre. I didn’t want to lie so I told her I wasn’t used to big towns and the soot and smoke, but that the welcome I’ve received from most people made up for being so far from home. She then asked me if there were any cars in Guernsey, I said ‘Of course! Several thousand! I later wondered if they pictured my home life as me sitting on a damp rock sucking limpets! Have had little time for diary writing lately as both the children have been afflicted with German measles! It is particularly irritating given that our island home has been invaded by the Germans! 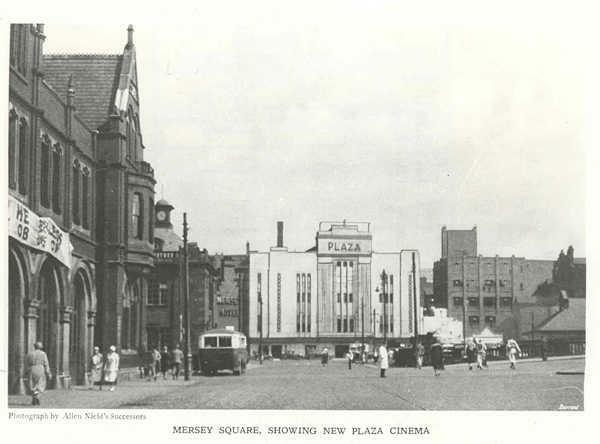 Called at the Stockport cinema again and have been offered some work during the afternoons! I start in two weeks. Mrs Batisse has offered to care for my children from end of school until 7pm, so we will have some money at last for warm clothing! The climate is much cooler here in Cheshire than in Guernsey! I visited the Housing Office to find out how much it would cost to rent a small house. Was shocked to hear that,unless my husband is in the Forces, I am not allowed to rent property. Am very upset but there must be some solution!! Saw our Guernsey Headmaster and he is meeting the WVS soon to discuss obtaining clothing for his pupils as most only have what they wore when they left Guernsey. Good news! Mrs Batisse suggested my two children and I share a house with she and her 3 children as her Bill is in the Forces so she can rent property! Great news and has cheered me up. Mrs B and I looked at an empty flat and an empty shop in Stockport. They were not fit for pigs to live in! We are evacuees but we have some pride! Got a surprise today, a visit from Mr Laine who escaped from Guernsey in a rowing boat 2 days ago, right under the noses of the Germans! He was luckily picked up by a British boat in the Channel. He told us about the German occupiers and all the rules and regulations! What an eye opener! He had no news of my dear husband and parents. The Education department are trying to close our Guernsey school! The Headmaster is trying to reason with them: when he left Guernsey he made a promise to the pupils’ parents to care for them totally until he could bring them back home. In our school they are with their friends each day, so have ‘a touch of home’ to make up for having no parents here! Hundreds of people in Lancashire and Cheshire have sent our Guernsey children clothes, shoes and toys! And household items for us evacuee mothers! There were appeal letters placed in the papers by the local councils and our Headmaster, and the response was overwhelming!! Such kindness makes me want to weep with joy! I doubt any of us will ever forget this day! Mrs Batisse has been to look at an empty shop which might suit us all. I visited it this evening – large room where the shop window is, scullery and kitchen with two large bedrooms upstairs. Quite clean too! We will be able to move there in two days! Two Guernsey mothers, with their children, lived in this Stockport corner shop for 5 years. Whilst in Stockport today I met Reverend Milnes, the Head of Guernsey Elizabeth College. 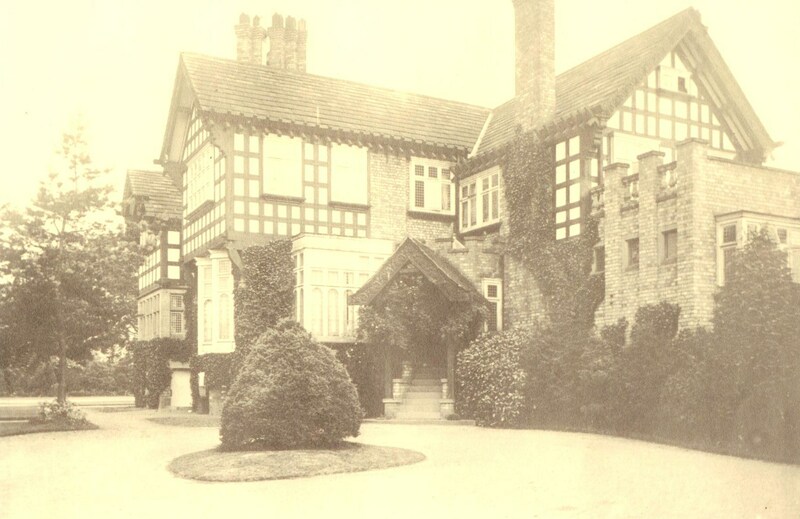 He and his pupils and staff originally arrived in Oldham and were very well received but he has moved the college and staff to Great Hucklow in Derbyshire so that they can enjoy the country air that reminds them of Guernsey and home. However accommodation is limited there and some boys are sleeping in an aircraft hangar! I began employment at the Stockport cinema today. I walked to the cinema which only took me about fifteen minutes, the weather was nice and dry. Saw several Guernsey folk on the way. I helped to sell cinema tickets and chatted to the customers during the interval. One lady asked me where I was from and I told her ‘Guernsey’, and received the now expected reply, “Fancy that, and you can speak English too!” I told her that Guernsey also has many of the modern conveniences that Stockport has – cinemas, cars, etc, but that we don’t have as much traffic and certainly nothing in the way of soot and smoke! She laughed and replied, “Where there’s muck there’s brass”. I didn’t understand what she meant but I will find out from my neighbour, Mrs Hoban. Mrs Batisse prepared dinner for my children after school, and when I returned home at around 7pm, they were ready for bed. Mrs Batisse is also looking for work, and I told her that I would ask if there was another work shift available at my cinema. Had an upsetting time with my daughter Joan today, she would not look at me when I was getting her ready for school. I asked her what was wrong, and she started to cry saying “You didn’t meet us from school yesterday and didn’t come home for ages, you didn’t eat with us, its not fair, I missed my cuddles and I am missing my Daddy. When are we going home to Guernsey to see him?” I became rather upset but sat her on my lap to explain why Mummy has to go to work, and that Daddy is fine, that he is a clever and brave man, and that as soon as we are able to write to him, we will write a letter together. I think this cheered her up a little. I sometimes forget, as I am so busy trying to keep our family together, body and soul, that I am not the only person in this family to miss my dear John. Please God that he is safe in the hands of the Germans! I met Mrs Pelley in the street this morning, and she had heard from her cousin Daphne who was on the last boat to leave Guernsey on 28 June. The harbour was under attack from German aircraft as the evacuees were boarding the boat. Daphne got onto the boat but in the rush and panic that was ensuing all around, she became separated from her young daughter. After the brutal attack ended, Daphne realised that her daughter was not amongst the passengers within the boat! She ran onto the deck and began to shout “Where is my daughter? Someone please help me!” She looked back at the harbour and saw her little girl standing there, crying. Luckily someone witnessed the situation, and passed Daphne’s little girl to her, over the ship’s rail, as it was about to depart Guernsey! A terrible experience for all concerned. Valerie Pales was handed over the ship’s rail to her mother, just as the ship began to depart from Guernsey. Had a busy few days at work, with little time for diary writing. Our Headmaster called round to tell me that he has received a letter from another escapee from Guernsey who has just settled in London, with friends. The letter states that, in the first two days of the Evacuation from Guernsey, his friend, a Veterinary surgeon, had to put 2,000 cats and dogs to sleep, because people were fleeing to England and there was apparently no one in Guernsey that could care for their pets in their absence. The animals would have starved to death. It is so upsetting to think of this. Our dog Molly died a few years ago, at the age of 12. I could not have borne having her put to sleep if all my family had decided to leave Guernsey. How wonderful it was. It had her address on it so I will write to her and tell her about my family. I will keep that note always. Mrs Batisse and I went into the centre of Manchester today. City life is so very different to the streets of Guernsey where everyone had the time to stop and chat. Everyone here in Manchester is in such a rush, looking at their watches rushing around. I expect many are doing war work too. Worked at the cinema today for 5 hours, chatted to several customers. One said “Why did you choose to come to Stockport then?” I said “We had no choice as to where we were sent, we were placed on trains at Weymouth and sent here” She then said “Did you bring all your furniture with you?” I was stunned and told her “No, we were evacuated before the Germans invaded Guernsey, and all I had were the clothes I had on, my two small children and one suitcase”. She seemed amazed. Another customer was not surprised about my situation, however, as he had read about our arrival in the newspapers, and had donated some blankets to us in the reception centres. I told him that we were all very grateful for such things, and for the kindness we have encountered ever since in Stockport and Cheadle Hulme. Whilst at the church coffee morning I chatted to two local ladies. We talked about rising food prices and shortages. One then said quietly “Please don’t be offended dear, but I thought that people from the Channel Islands would be brown”. I explained where Guernsey is with relation to England and France and told her about our lovely island. She invited my children and I to tea on Saturday which was very nice of her. I worked a double shift yesterday and had no time to write my diary, I just fell into bed when I got home! Spoke to our Headmaster this morning, and he said that one of his pupils, four year old Harry, has become very attached already to his new billeters, or ‘foster parents’. In fact he seems to have ‘adopted’ them. When our Headmaster asked Harry whether he missed his own Mummy and Daddy, Harry replied, “I have a new mummy and daddy, and they love me very much”. I suspect that this is going to cause more and more problems for the smaller children, the longer that we are here in England. I advised Mrs Batisse today that the cinema where I work has work for her also. This would mean that she would do a morning shift, then I would do an afternoon shift. I can sort our respective children out in the mornings and she can take over in the afternoons. In addition we will have a little more income to spend on the children, and on the rising prices of food and clothing. We might even buy a rug for the bare floorboards! I met another Guernsey mother today when out shopping. She lived in my parish in Guernsey. Her husband is in the Army and she is very worried about him. His health is not too good but he insisted on volunteering to fight against the Nazis who have occupied our island. He somehow passed his medical. I saw Mrs Martel today and she had a sad story to share with me. Her cousin left Guernsey a day after us, with her young daughter who had recently had a tonsillectomy. The girl became very ill on the Channel crossing and sadly died as the evacuation ship landed in Weymouth. The mother and the whole group of evacuees was very distressed as you can imagine. How dreadful! I must remember to count my blessings despite the fact that I am missing my dear husband so badly. Hopefully the day will come when we can perhaps write to each other. I heard today that one of the Guernsey Catholic schools has relocated from Lancashire to Knutsford. They cannot afford clothing or school books. I hope the local people there will respond kindly to the plight of those girls and boys! I have had a dreadful day today, I have a terrible headache and think I am starting with a cold. The temperature here is so much cooler than in Guernsey, despite it being late summer here in Cheshire. I feel very low too because I am missing my dear husband very much and wondering how the rest of my family are. Still no news has come through from Guernsey, will the Air Force or Navy try to liberate our island? Perhaps it is too dangerous for them to try- in such a small place, our own people would be injured. One hopes that the Germans will find somewhere else soon to send their troops. What can they want with Guernsey except perhaps to annoy Mr Churchill? I met a Guernsey lady that I recognised from home today near the Town Hall. She seemed upset, so I took her for a cup of tea and asked her what was the matter. She said that her son had left Guernsey on 21 June with his school, and that she had followed on another boat a few days later, arriving in Stockport. It had taken nearly two months to determine where her son had gone, and he had actually been sent to Glasgow! He arrived in Stockport by train two days ago and when he saw his mother, she hugged him and asked him to take off his coat and hat. He replied “I don’t need to, I will be going home to Glasgow soon wont I?” She said it was all she could do not to burst into sobs in front of him. She could not believe that he had become accustomed to life with another family in Glasgow, so quickly, and that he had even considered not staying with his own mother. 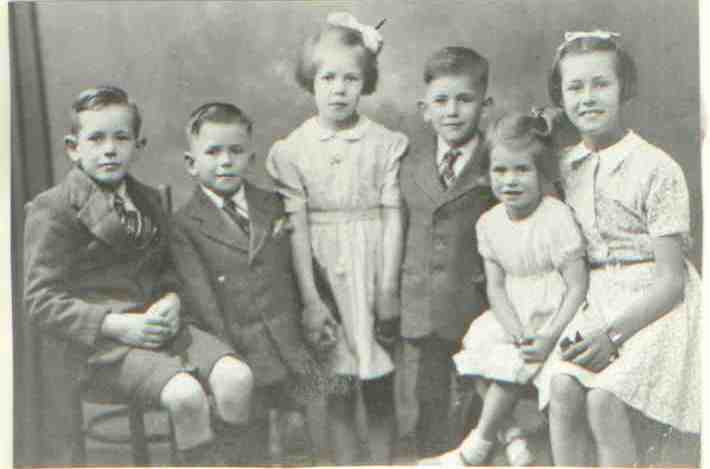 The Tippett children were separated from their brother John who was sent to Glasgow with his school. They were eventually reunited. Lots of our evacuees helped to raise funds for the war effort at a local event today in the village. We baked biscuits to sell and served on stalls or served cups of tea. I know we have needed help ourselves from the local community but it is wonderful for us Guernsey evacuees, children and adults alike, to be able to do something for the war effort, however small it may seem. Mrs LeTissier called round yesterday for a chat, she said to me “I had to get away from the house for a while! My father in law is driving me to distraction! I know he is a relative, but he had his own bungalow in Guernsey, and he is providing to be very difficult to live with. He shouts at my children and complains about my cooking. I do the best I can for my husband’s sake, but I just had to get away from him today for an hour!” When she left, I thought about what she had said. Yes, her house is full of Guernsey people, who are sharing the experience of being exiled from their island, but it can be difficult sharing an overcrowded home with relatives or friends. Luckily Mrs Batisse and I are getting on famously, but one never knows when we might have a difference of opinion! I bumped into Mrs LePage today and she is much worse off than I. She left Guernsey with just the following: her 6 month old baby, two feeding bottles and six nappies, plus the clothes that she and her baby were wearing. She is lodging with a widow lady in Stockport, who does not like the sound of children. She constantly tells Mrs Le Page off whenever the baby starts crying. I wish we had another room in this house, so that we could take the poor woman in! I advised her to go to the Housing Office to see if she can be moved. One cannot stop babies from crying! Eva L:e Page left Guernsey with just her son Anthony, nappies and feeding bottles. Mr Martel called round today to say hello. He told me that Mrs De Moulpied still has not found her 5 year old daughter Brenda. The last time she saw Brenda was when her daughter waved goodbye to her from the deck of the SS Viking, as it left Guernsey in June. Mrs DeMoulpied left Guernsey two days later on another ship with her son. Brenda had no idea that she was leaving Guernsey for a long time – she had actually been told that she was ‘going on a day trip with the school’ so as not to frighten her. Hopefully the authorities, or perhaps the Channel Islands Refugee Committee in London, will be able to reunite the family. A gentleman from the Stockport Billeting Office called round to our home today whilst I was working. Mrs Batisse was home and she had her children and mine with her. He looked around the crowded room and bluntly remarked “All these children might be better off if you placed them with local families who have larger houses and more income “. She looked him right in the eye and replied “My husband is fighting in the Forces and my parents are trapped with the Nazis. If its all the same to you I will keep my children with me!”. He left very soon after that. Marlene Whittaker was separated from her family in England for some months. I had such a shock yesterday afternoon. I left the cinema after my work shift, and came outside into total darkness, at only 6 oclock in the afternoon! The air was thick and dark and damp and I could not see my hand in front of my face! I went straight back into the cinema to ask what on earth was going on. 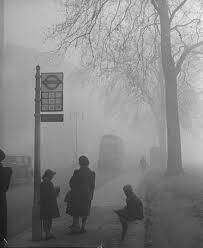 Mrs Johnson laughed and said to me “Haven’t you ever seen smog before dearie?” “Smog? What on earth is that?” I replied. She took me out to the foyer and explained that from Autumn to Winter, the fog often descends on Stockport and mixes with all the smoke that is coming out of the factory chimneys. “It blots everything out” she explained, “they have it in London too I believe. Its much worse than this in the winter, so your bus should turn up. You will have to get to the bus stop as best you can, and do watch out when crossing the roads, as cars and bicycles might not see you – and you might not see them!”. Well, what a time I had getting to the bus stop, stumbling along the pavements, holding onto the walls and working out my route as best I could. The smog even muffled sounds! I walked right into another lady as I got near the bus stop, we both had to laugh! I had to wait nearly 45 minutes, but eventually a bus came, emerging out of the mist! 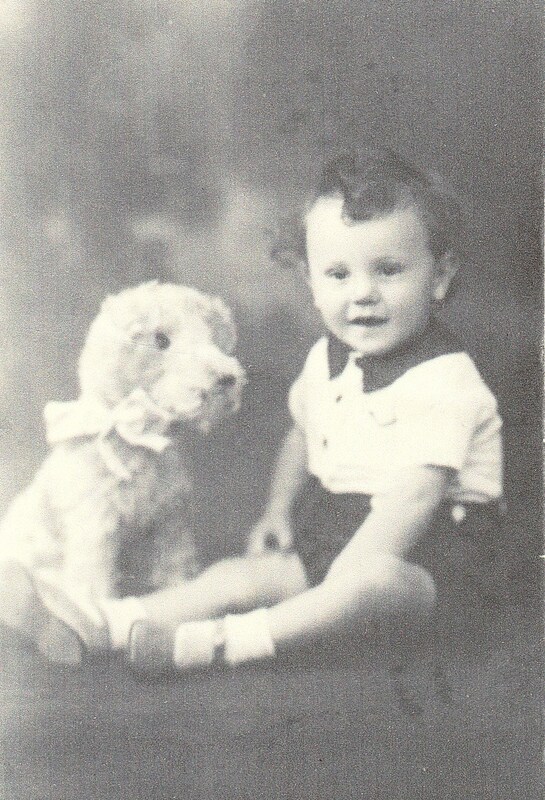 I was visited by Mr Martel today, who said that a Guernsey evacuee family had just arrived in Stockport from Bradford in the county of Yorkshire. 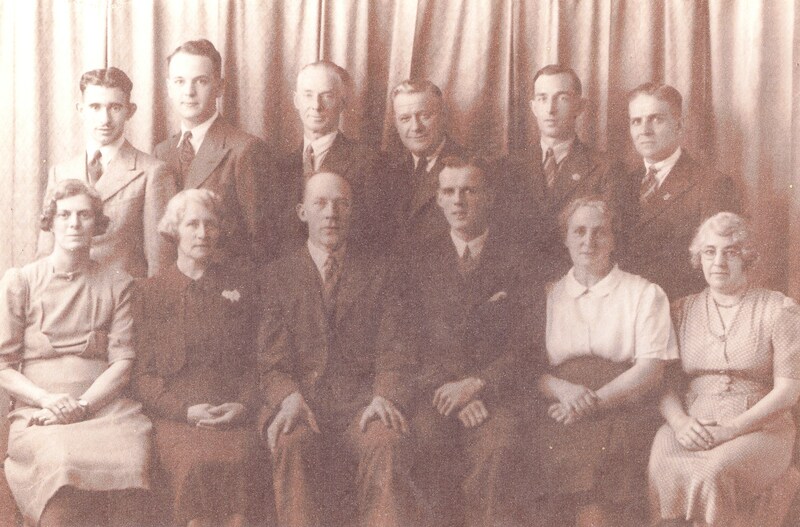 They had transferred from Bradford to join family members in Stockport. They told Mr Martel that when they had arrived at the Bradford evacuee reception centre at 6 oclock in the morning, they had been greeted by the Mayor of Bradford. They were very impressed! They were horrified however by the heavy layers of soot on the Bradford buildings. I told Mr Martel I would be glad to meet this family when they had settled down, to hear about their experiences in Yorkshire. 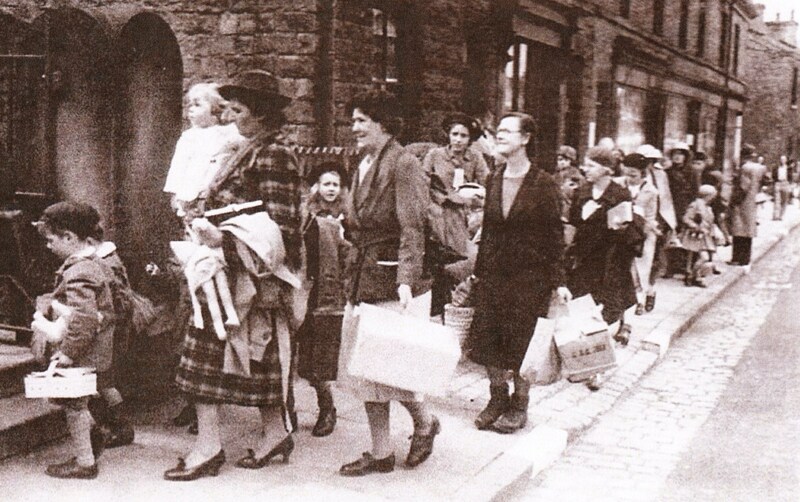 Mrs Batisse told me today that over 50 Guernsey evacuee orphans have settled in a building in Bury in Lancashire. Her cousin is there with the children, taking care of them with five other adults. The local people have been kind to the orphans, sending them food, shoes and blankets. In contrast, Mrs Batisse mentioned that her son was bullied outside school today, by an older boy- he was being called ‘a foreigner’ and was pushed over in the street. He was very upset. Our neighbour Mrs Hoban saw Mrs Batisse struggling with her baby son today and gave her a pram! How kind and thoughtful. We had to leave such items at the harbour when we were evacuated from Guernsey. I wonder what happened to all those prams and cars and bicycles? and so very understanding of our position. One of the school children received a letter from her Aunt in Guernsey today! 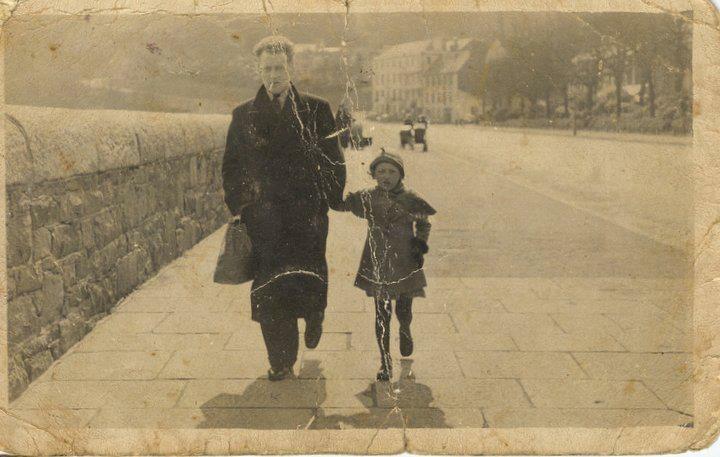 It had been posted from Guernsey a few days before the German occupation and since then has been passed around the various evacuee reception areas until it reached the little girl yesterday. She came to our home to show it to us, and it read “My darling little Rachel, what a lucky little girl you are to be away with all your little school friends. I know you will be a good girl and do everything you are told. God bless you my precious darling, Lots of love and kisses, from Auntie Ella”. What a wonderful letter! 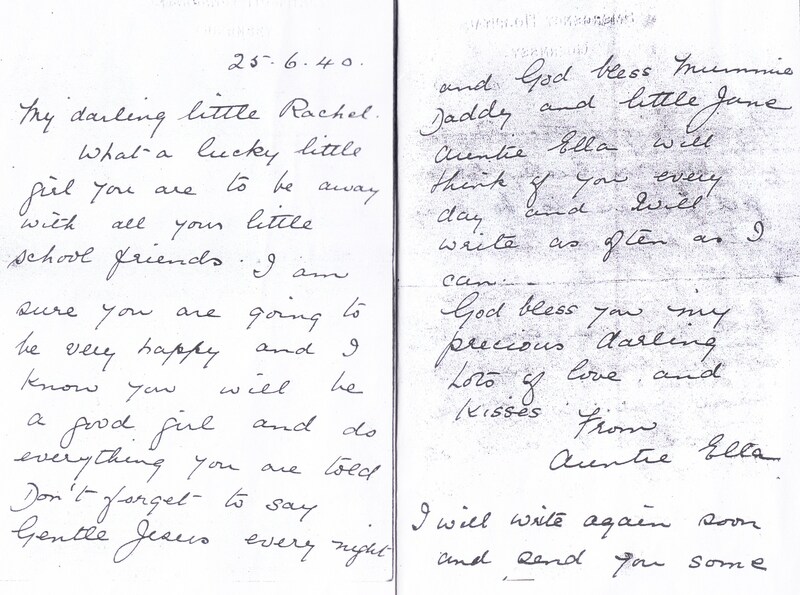 It must have been very emotional for that lady to write, wanting to reassure her niece who is so far away from her, and for God knows how long! Mrs De Moulpied has at last been reunited with her daughter Brenda! It turns out that Brenda had been sent to an evacuee reception centre in Bury in Lancashire in June, and was being looked after by a Mr and Mrs Brown. Bury Council apparently contacted Stockport Council in order to reunite the family, but I also understand that an organisation called The Channel Islands Refugee Committee in London, played their part. Mr Martel will know more about them so I must ask him. Mrs De Moulpied was reunited with Brenda at Stockport railway station yesterday evening, and it was a wonderful time for them both with lots of tears of joy. Brenda may be able to join the Guernsey school too. How lucky I was to have been evacuated with my own precious children! I met Mrs Ogier today and asked her how she and her children were coping in Stockport. She said that her little girl was ill recently and was cared for very well in Stockport Infirmary. They have a lovely flat to live in too. “We have running water and an inside toilet – unlike at home” she told me “and when the war is over and Ron is demobbed I am going to suggest we stay in England rather than return to Guernsey”. I was surprised by her words but I remember her old fashioned Guernsey cottage where she had to draw water from a well. Perhaps other evacuees will consider this option too! The Guernsey ladies in this area now meet up weekly to chat about how we are all coping in England and to discuss concerns over our relatives in occupied Guernsey. Mrs Le Page told us that she has found a small flat for her and her baby. She is so glad to be able to move out of the home of the elderly widow who, although well meaning, cannot seem to stand the sound of babies crying. I had a cup of tea and a good chat with my neighbour Mrs Hoban today. We were talking about making ends meet and she told me that her two daughters now work in factories so have a better wage than they used to earn. One girl used to be a maid in a large house in Bramhall but now works at an aircraft factory. The other girl used to work in a grocers shop but now makes wireless components. I asked her if they could kindly let me know if either factory wanted more women shift workers as I could earn much more there than I do at the cinema. Mrs Batisse and I had a good chat over tea last night about the differences in language here in England. The accents vary from place to place, so sometimes it is hard to understand the odd word or two contained within a sentence. For instance, in Stockport ‘starved’ doesn’t mean ‘hungry’ but ‘cold’. Mrs Hoban next door calls dishes ‘pots’, and the passage ways between houses are called ‘ginnels’ although I am unsure if I have the spelling of that word correct. So even though Mrs Hoban and I both speak English, there is sometimes a bit of confusion. Some of the older Guernsey ladies here also speak some of our Guernsey French patois, but do not like using it in case they are though of as using a ‘foreign language’ which causes suspicion when out in public. After all, we don’t want people thinking we are foreigners, or even worse – foreign spies!! Mr Martel called round this morning and gave us more information about the Channel Island Refugee Society that has formed in London. They have made public appeals to raise funds to help the evacuated children who are here from our Islands without their parents, and they are also keen to assist us mothers in times of hardship which is wonderful news. Head teachers such as Mr Martel will be in frequent contact with the society and his current priority is to obtain warm coats and boots for all his pupils. Mrs Robilliard called round today and told me about a shocking time she had experienced last Friday. On that day, she and her baby had just moved into a furnished room in a house in Manchester. At 6pm Mrs R had put her baby to bed. An hour or two later, as the light in the room began to fade, Mrs R heard a noise on the wall behind her. She turned to see what it was and saw something crawling along the wall, then noticed that there were at least a dozen shadowy objects moving along the walls of the room. On closer investigation, she realised that they were insects of some sort and that there were more and more of them appearing on the remaining walls of the room. She lit all the candles that she had in her possession and sat up all night, so as to ensure that the ‘bugs’ did not crawl over her baby daughter. She also collected a few of the creatures and put them into a match box for evidence of the situation. The following morning, totally exhausted, she had packed her bag of possessions and taken them, with her baby, to the Housing Officer, requesting a move to another property. When the Housing Officer showed no sign of compassion, Mrs R released the bugs onto his desk, saying “Would you like these crawling around your bedroom every evening?” She said it was amazing how quickly the Officer found new accommodation for her! Luckily the new rooms she has been given seem to be clear of ‘bugs’. My poor son was taken ill today with a really bad chest. I was so worried as I have hardly any money and I have heard from other Guernsey mothers that calling for a doctor costs a great deal. I went to see Mrs Hoban next door who said to me “Don’t you worry, love, I will get Doctor Brown out and he will come and see your boy, and you can pay him back a few pennies a week, he does that for all of us around here, bless his heart!” She was true to her word and Doctor Brown did examine my boy and provide him with some cough linctus. I can pay his bill over the next six weeks, which is a real weight off my mind! Mrs Batisse received a surprising visitor yesterday! her dear husband Bill. He had received 24 hours leave from his army training and came up on the first train he could! We had just eaten when we heard a knock at the front door. Mrs B went to answer it – she opened the door and stood there rooted to the spot in silence. I stared to rise from my chair thinking something terrible was happening, when she called “Oh Bill, my dear!” and stepped out into the front garden to embrace him. It brought a tear to my eye I can tell you. The children were playing in the park so I went out for a walk so as to leave Mr and Mrs B alone in the house to afford them some privacy. It made me think of my own dear husband, who I sorely miss, but I wiped away my tears of self pity and went to play with our children in the park for an hour. 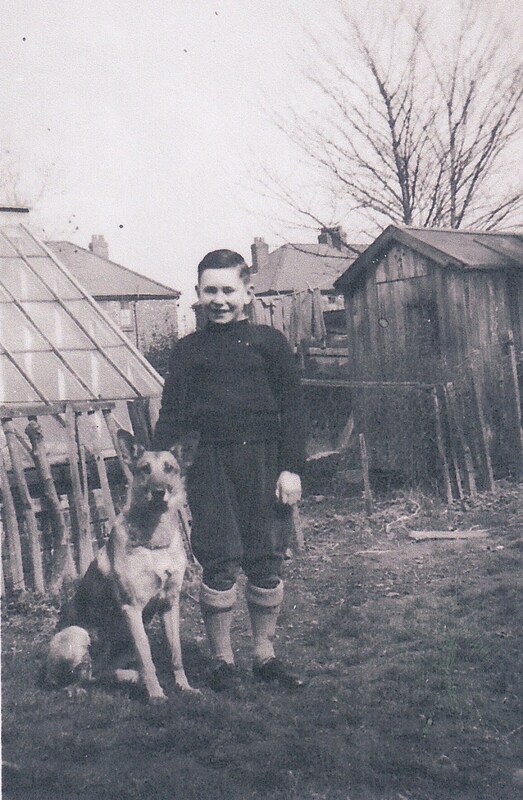 Brian Hatton arrived in England with his mother, whilst his father joined the Forces. Today it is my Mother’s birthday, I wonder how she is, and what she is doing today in Guernsey? Will it be possible for any sort of celebration there, with everyone being under German occupation? I am really missing my dear husband, parents and sister dreadfully. I wonder if my sister Adele left for England with the Ladies College when it was evacuated? I have no way of knowing. Perhaps Mr Martel may find out through his communications with the Channel Islands Refugee Society in London, I will ask him next time we meet. I took the children for a walk today to get some air as the sun was shining, although it was not particularly warm. The nip of autumn is in the air, and I dread what winter here will bring, unused as I am to England’s winters. Mrs Hoban said it is usual for us to have snow. I must see if Mr Martel can help me to find a winter coat before too long, otherwise I am sure I will be ill. I have been dreadfully ill since I last made an entry in my diary. I could hardly breathe, and ached from head to foot. I had to get the doctor to my home again, which incurred yet more cost. I could not go to work, so Mrs Hoban very kindly looked after our children for us whilst Mrs Batisse was working her shift at the cinema. Just managing now to eat toast and tea, feel weak as a kitten. Hope to return to work tomorrow afternoon if can face the walk! How I am going to pay two sets of doctors bills, I just do not know. Mrs Hoban called round today unexpectedly and found me crying over the two doctor’s bills that I have to pay. I know the doctor said I could pay something each week but even so, that now that means I can afford less fuel, and food for the children. Imagine my surprise, when an hour later, Mrs H returned with the sum of ten shillings which she had collected from the neighbours on our street! I did not want to accept it, but Mrs H insisted that the ladies who had contributed a shilling each would have been very offended! I will ask for their names when I am well again and call round to thank them. Perhaps I could give them a gift of home baked biscuits if I save up some eggs. I have been very lucky to arrive in this street amongst these kind women – some of the other Guernsey ladies have not been so fortunate! Mr Martel called round today and gave me some information on the whereabouts of my sister Adele, who was evacuated with the Ladies College. He understands that they were eventually taken to a village called Great Hucklow in Derbyshire, with the Elizabeth College boys. I assume the two groups would have been housed in different buildings! He will see if he can obtain any more information for me so that I can write to her. Then perhaps, when I can afford it, I could find a way to travel there to visit her. I imagine she has been in her element caring for the girls in her college, she is a wonderful teacher and an even more wonderful sister. I received ad an unexpected visit from my cousin Molly today! She left Guernsey as a helper with a school and now lives in Bury. She tracked me down through Bury council somehow. She lives with two other families in a brand new house! It was lovely to reminisce with her and talk about family! Mrs Hoban told me today that a local aircraft factory is looking for more ladies to do shift work. Apparently the pay is very good and much higher than my wages from the cinema. Mrs Batisse and I plan to pay a visit to the factory to ask for more information and to ensure that we can have different shifts in order to continue sharing child care in our home. It is my birthday today and although Mrs Batisse put on a little tea party for me, the day was tinged with sadness for me. I have still heard nothing from my dear husband in Guernsey. Nothing since the Nazis occupied my dear island home 3 months ago. I fear for his safety and the safety of the rest of our families there. Please god they are all well and unharmed. This morning I enjoyed repaying my neighbours who clubbed together to contribute towards my doctor’s bill a short while ago. I have spent the last ten days saving up our eggs, and today I baked each of them a cake, and a batch of biscuits. Mrs Jones across the road was delighted as she confessed to me “To be honest, I am poor at baking and cooking, and my husband will be really pleased to eat something edible for a change!” Still no news from my husband in Guernsey, this family separation is awful. The past few days have been terrible beyond belief, as diphtheria has swept through our school community. Ten children are seriously ill, and one little boy, aged 6, died yesterday. His parents are in occupied Guernsey and how and when we are going to tell them about their son, I just don’t know. My children have been so far unaffected and Mr Martel has temporarily closed the school for a time to as to stop any further infection. I pray to God that no more children die or catch this terrible infection! No more children have died, although one little girl was in dreadful crisis last night. I am also worried that I will soon have to stop writing my daily diary. The small notebook that I brought with me from Guernsey is almost full, and I just cannot afford any more paper at present – part of the doctor’s bill is still outstanding. I will ask Mr Martel if he has any spare paper in the school, although he may be struggling also to provide paper for the pupils. Mrs Batisse was chatting to a neighbour this morning. As Mrs B commented on the chill in the air, the neighbour remarked “Wait until Winter comes! You Guernsey folk will really feel the cold then!” She is clearly under the impression that Guernsey is a sub tropical island, bless her! Mr Martel kindly gave me some paper which I can use to continue my diary. I am so grateful, as I would love to show this diary to my dear husband when we are reunited, so that he can read my daily thoughts. No more children have died from diphtheria which is a blessing. We had another terrible fog last night, it descended upon Stockport like a huge grey cloud. I had some washing hanging outside and when I brought it in, it was so full of soot that I had to wash it all over again. Mrs B came home and said she had almost been hit by a car which was crawling along the road in the fog. Its headlights had been covered, which is essential during the blackout, so she could not see the car approaching. she was very lucky not to have been injured! Awful news received today as one 3 year old Guernsey girl died of diphtheria. Her mother lives close to us and has collapsed with grief and despair. She just cannot face writing to her husband in the Army to tell him of the death of their only child. I will visit her as often as I can to offer comfort. I managed to work a double shift at the cinema today and earned just enough to settle the balance of the outstanding doctor’s bill. That is a real weight off my mind, and I feel I can now start afresh. I fear that we may still be in England for Christmas at this rate, so am going to save a few pence each week in order to buy presents for Mrs B and her children, and mine. There wont be any presents or cards coming from Guernsey to England for the thousands of evacuated children, which will upset them greatly. I have worked several more double shifts to start saving up for Christmas but I may have over done things. I have worn myself out totally and left myself little time for diary writing. I just need to sleep tonight to try to get some energy back. Mrs Le Messurier has received some awful news. 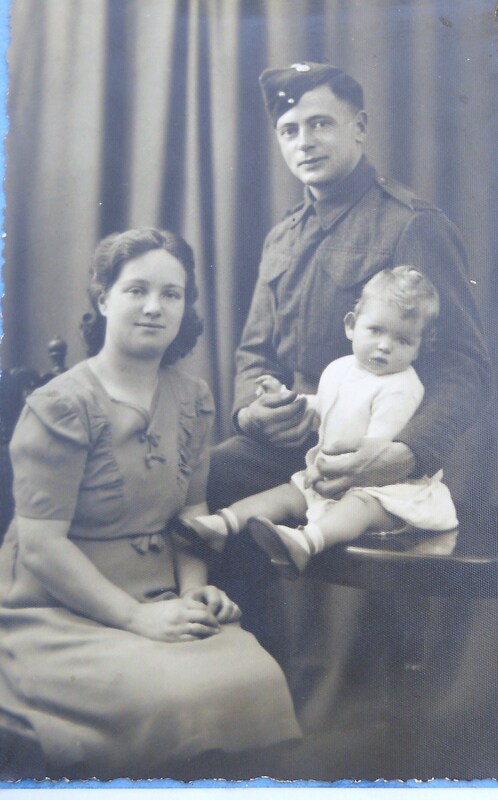 Her 19 year old son has been killed in action – he joined the Army at Weymouth when we evacuees arrived there in June. She has no way of contacting her husband and other son in Guernsey to let them know of this dreadful news. I tried to comfort her as best I could, with a cup of tea and a hug, but she is inconsolable. I met Mrs Digard whilst at the butchers today. She has only just located her two children who were evacuated with their school the day before she herself left Guernsey in June. They were living with a widow in Burnley and were in a terrible state! They slept on a camp bed in the hallway of the house and were not allowed in any other part of the house except for the outside toilet. They were also very hungry and very dirty, clearly the widow had taken them in so as to receive the billeting allowance! So many thousands of our evacuee children are being well cared for by English families, but now and then there are exceptions. This morning I bumped into Mrs Ogier at the greengrocer shop. When we left the shop with our provisions she told me that her family has just been joined by her Grandfather who was originally evacuated to Bolton. He has obtained work at the Christy Hat Factory. She then whispered to me that his name is actually Adolf (short for Adolphus) Ogier, but he wishes to be known as ‘Bill’ due to the hatred of the name ‘Adolf’ Hitler. Today has been such a mixed up day of happiness and sadness that I do not know where to begin! This morning I received the wonderful news that there may be a job opening for me at Fairey Engineering and I am to attend an interview next week. The pay is good which will help our household no end with purchasing clothes and food. However, my moment of happiness was dashed later when Mrs Ogier called round to say that one of the Guernsey boys who had recently left school had just been killed. He had obtained employment at the Fire Station and was rushing to work yesterday morning in the fog. He crossed the tram track just as a tram was passing, but did not realise that another tram was travelling in the opposite direction. He was crushed instantly. His mother is here in England, but his father is trapped in occupied Guernsey. They have no other children. I could weep for them. Mr Martel received a letter today from the Head of Elizabeth college which was evacuated to Great Hucklow in Derbyshire. The boys outnumber the villagers and are in cramped accommodation. The Senior boys have now moved to a large house called Whitehall near Buxton and are building a chapel there so they can hold services on Sundays. Those growing boys must be a quite a handful for the Head, his wife and the few Guernsey teachers! The children who were ill with diphtheria are now well enough to return home, which is wonderful news. They have been in isolation and badly missed by their school friends. They have missed some school lessons but Mr Martel hopes that they will be able to catch up with their work. I received a visit from Mrs Delaune who has moved to this area from Bradford, and she told me that upon the night she arrived in England in June, the Mayor greeted her very kindly, but a council official spoke French to her. She laughed and told him “I can speak English young man” which shocked him no end as he had obviously prepared himself for speaking French. Another example of a lack of understanding of our island and its connection with England. Hopefully our time in England will at cement a connection between Guernsey and England, which will last for many a long year. Please God we can go home again soon when the Nazis leave Guernsey! I still do not understand what they want with our little island. I attended my interview at Fairey Engineering today and endured a very stressful interview with two gentlemen who clearly would have preferred a man for the job! But no matter, for at the conclusion of the interview, I was offered a position. I begin in a week and will receive a wage of £1.50 per week which will help me to obtain clothing for the children for winter. I will be doing tensile testing, that is, working out how much pressure can be put on particular metals used in the construction of aircraft parts. I will also carry out corrosion tests. A very responsible position. My dear husband would be amazed but proud! Mrs Gallienne visited Mrs Batisse today as they are cousins. She told me that one of her daughters was billeted with a family for the past 3 months and that the family stole her daughter’s clothing coupons to buy items for themselves. Mrs G said told us that when she opened her daughter’s little suitcase, she found inside one vest and no sleeping garments at all. A dress that she had made for her daughter was in there but it was absolutely filthy, and had clearly never been washed. They had obviously used the child’s clothing coupons to buy clothing for themselves. She has written to the billeting officer to report the incident. I received a letter today from my sister who was evacuated as a teacher with the Guernsey Ladies College. They have moved from Great Hucklow in Derbyshire to Denbigh. I am not sure where Denbigh is but Mrs Hoban suspects it is in Wales or close to the border. My grocery shopping today proved even more expensive than last week! Even with my new job starting, things will not be easy particularly with Christmas coming! Still no communication from Guernsey so I presume there will be no Christmas cards or gifts for the thousands of evacuated children! Mrs Ozanne had a letter from her sister Sheila who was evacuated to Halifax which contained dreadful news. An air raid warden had carried Sheila’s baby to the shelters whilst Sheila had carried her 2 year old son who is ill. The warden actually dropped the baby boy but did not admit this to Sheila. The baby died later that evening, when the air raid warden finally confessed to what had happened. To lose ones tiny baby so soon after leaving her husband and parents behind in occupied Guernsey must be so hard for that poor lady to bear! Mr Martel called today, he had had a meeting with Mr Victor Lewis who is the News Editor of the Manchester ‘Daily Sketch’ newspaper. Apparently, Mr Lewis toured the evacuee reception areas, in June this year,interviewing and photographing our evacuee children, and passing the images to other newspapers, in order to spread the word about how many of us Islanders are here in Northern England. He even managed to get an article into the Guernsey Star, just prior to the Occupation of the island, to let the parents know that the school groups had arrived safely in England! Mr Lewis even gave Mr Martel a copy of the article, part of which said: “This is a message to the mothers and fathers of Guernsey children who are now getting acclimatised to a temporary new life in the reception areas to which they have been sent in the North of England. These youngsters are safe and happy … the hospitable people of Lancashire have thrown open their homes wide to them.” This effort by Mr Lewis must surely have lifted the hearts of their parents in Guernsey at that time. Met Mrs C today, her family (father, mother, husband and two little boys) had fled Italy in advance of the Germans, travelled all the way through France, and ended up in Guernsey thinking it would be safe there. Within 3 months, they found themselves fleeing to England on the evacuation ships! 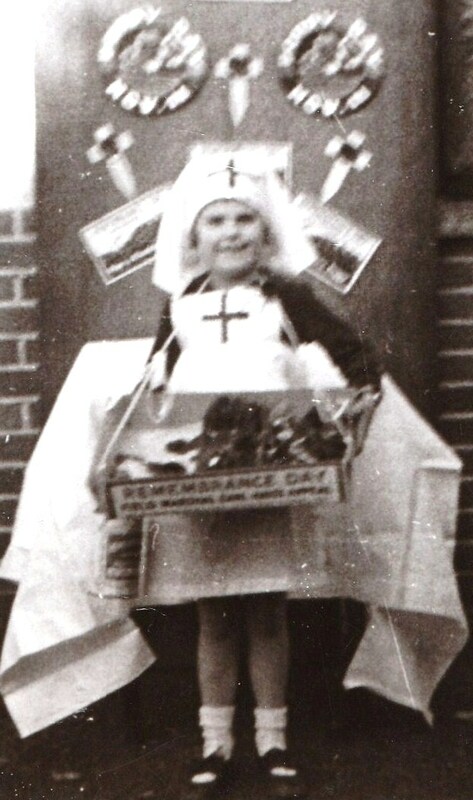 Mrs C travelled as a teacher’s helper with the Guernsey schools, and remembers that lots of the school children had been given lots of chocolate and sweets for the journey, which made them sick during the Channel crossing. She told me, sadly, “It never entered our minds how foolish we were to go to Guernsey and how quickly the Nazis would move in to seize the Channel Islands!” I commence work at the aircraft factory tomorrow and am excited but also terrified! Was too exhausted to write my diary last evening. 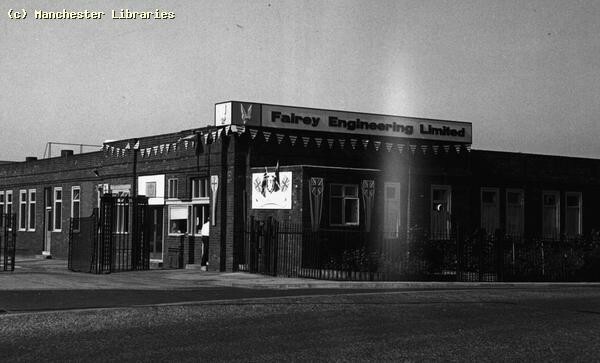 My first day at Fairey Engineering was strange and stressful. There are only two women there, myself and a lady called Mona from Manchester. It was made clear by our supervisor that they were desperate to fill the positions and that they would have given the posts to men if men had been available, which they are not. We spent most of the day being shown around the building, meeting people, learning more about the work that I will be doing with Mona. We received odd looks from the male colleagues there, who are not fit to join the forces or too old. It will take some getting used to but I will persevere. I met Mrs A today whilst shopping and she told me that her 60 year old Mother passed away last week. I was shocked as I had only seen her Mother two weeks ago and all seemed well. 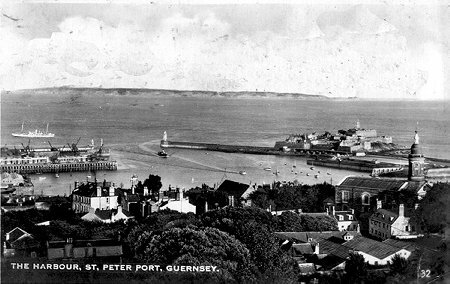 Mrs A explained that her Mother had only evacuated to Guernsey at her husband’s insistence. They had been married for 40 years in Guernsey and had never been parted for even a day. She had just faded away and the doctor said he could find no reason for her death other than ‘a broken heart’ at the separation from her dear husband. How sad that they will not be reunited when Guernsey is freed from the Nazi occupation! I miss my own dear husband very badly but I must remain strong for the sake of my young children. Mr Le Messurier called round today with a coat for my son which his own son had grown out of. I was very grateful. over a cup of tea we talked about our experiences since we left Guernsey in June. Mr L had travelled with a school group and he recalled the arrival at Weymouth, saying “It was quite pitiful. Many of the adults had been terribly seasick and officials were asking them to fill out registration forms and to answer lots of questions. Many of them just could not cope with it”. When they eventually reached Lancashire by train, they discovered that several of the school children were ill with scarlet fever and the whole party then had to go into quarantine for ten days. Mr Martel visited us today to update us on the clothing situation for his pupils. A number still have not got winter coats and he is so very worried that they will become ill with flu if they don’t receive warm coats and boots. Some of the boys are still wearing the clothes that they wore during the June evacuation and they are becoming threadbare. The public have been so kind, as have the WVS but these growing children will suffer badly if they do not receive adequate clothing. Mr M has written to the Channel Islands Refugee Committee again in London to speed up matters. I visited Mr Martel’s school today for an hour to talk to the female pupils to ascertain that they were happy in their billets. We received an unexpected visit from one of the teachers from the Elizabeth College in Derbyshire. 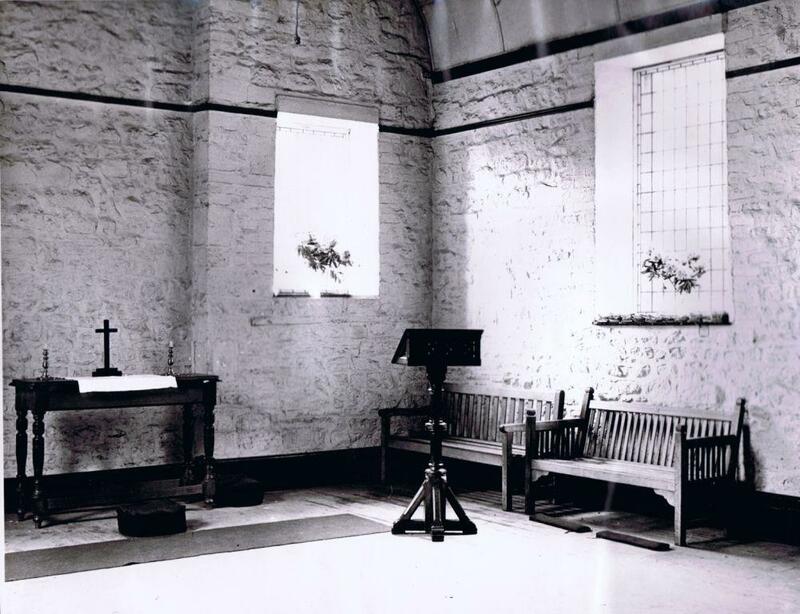 He stated that the boys have settled down into village life, but that they had at first found it difficult to take the exercise that they had been accustomed to in Guernsey – there was no sea to swim in, no gymnasium equipment to use and no playing field for games. However, they were adapting and now played cricket at Buxton three miles away, hiking and fishing, and have just begun swimming in a nearby reservoir. They were also giving the local farmers a helping hand. 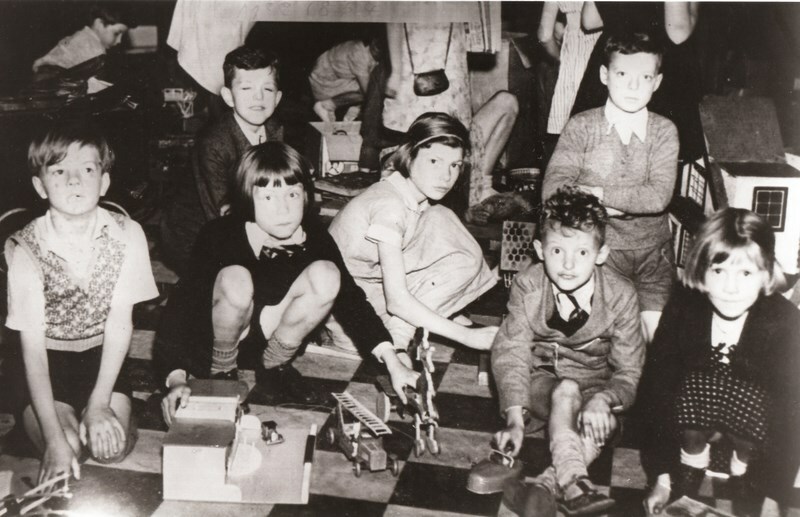 During bad weather, they made models, drew, read books provided by the local community and sang in a choir. I met Mrs Perriot on the way to the Church Ladies Group meeting today and she told me that her sister, who is billeted at a farm in Nantwich in Cheshire, endured an evening of German bombers recently. She spent a terrifying evening crouching under the farmhouse stairs as bombs rained down in the vicinity all around her. she told her sister that “The Germans were either miles off target or were merely jettisoning their loads willy nilly before flying back home. I met a Guernsey lady today, Mrs A, who has just moved to Stockport. Her family evacuated from Guernsey and went to live in Coventry where her husband was doing vital war work. They were caught up in the Coventry Blitz, the front door of their house was blown off and she and her children were lucky to survive. Just before the bomb blast, Mrs A told me that her children were walking back from the chip shop when a German plane flew overhead, machine gunning their street! The children threw themselves into someone’s front garden to escape the bullets. When they reached home, the youngest child seemed more annoyed at the fact that his chips had been crushed! Terrified, the whole family moved to Lancashire and were nearly bombed there! 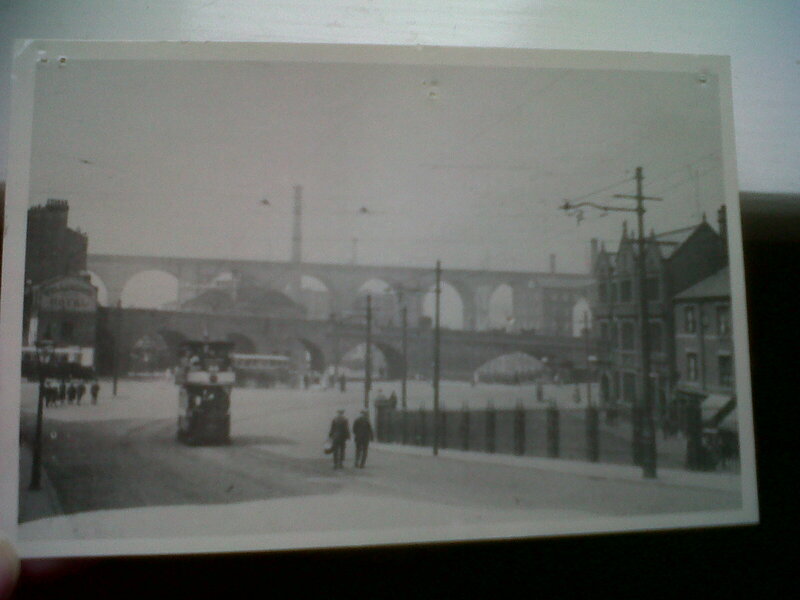 Now they are living Stockport as Mr A has found war work at a factory. Mrs J visited the coast last weekend and was taken in for questioning as a suspected spy! The military arrested her and she had to explain her presence in the area, the fact that she did not have a local accent, and the reason why she was carrying a camera. She told me “I totally understand why they did this. 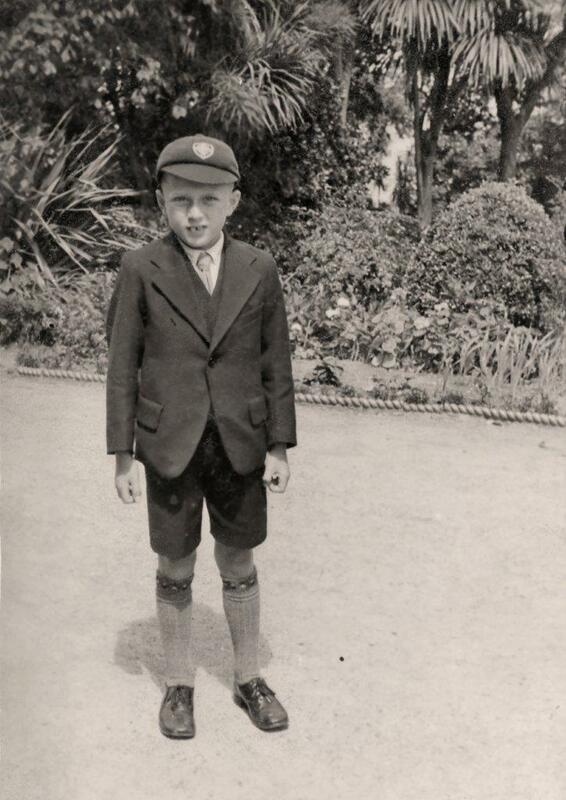 Once I explained that I was an evacuee from Nazi occupied Guernsey, they let me go on my way”. I met Mrs Perrier today whilst at the greengrocers. She looked very shabby and she is so very pressed for money, even more than my own family. Her children are very small so she cannot take up any kind of employment. She seems to be suffering badly with her nerves because of her worries. She is dreading Christmas as she feels she will not be able to afford any cards or presents for her children or even a Christmas meal. I was so upset by this that I invited her and her children to our home on Christmas Day for a bite to eat. I am good at making Christmas cards so can give her two for her children. She thanked me and said she was very grateful but she would not wish to impose. I asked her to bear my offer in mind, and to let me know before 18 December so that I can prepare for the day adequately. There was little to be had at the butcher’s shop this morning. I managed to buy a rather scrawny rabbit which I made into a casserole. I added beans and cooked it slowly, in an attempt to make it resemble one of our Guernsey recipes ‘Guernsey BeanJar’. However, the children did not like pulling the little rabbit bones out of their stew! I miss our traditional Guernsey recipes, I would love to be able to get hold of enough apples and fruit to make a Guernsey Gache cake for example. I am saving this week’s eggs to make a Christmas cake for us all. I went to Stockport market yesterday, and found a couple of inexpensive Christmas gifts for my children – a little tin whistle and a cloth doll. I wonder what sort of Christmas my husband will have, trapped in Nazi occupied Guernsey? I can write no more just now, I am too upset. I have had little time to write my diary this past few days as, in common with many other Guernsey mothers evacuated to the Stockport area. We have spent the past two days trying to locate a Guernsey lady, Mrs Bienvenu, in the district. 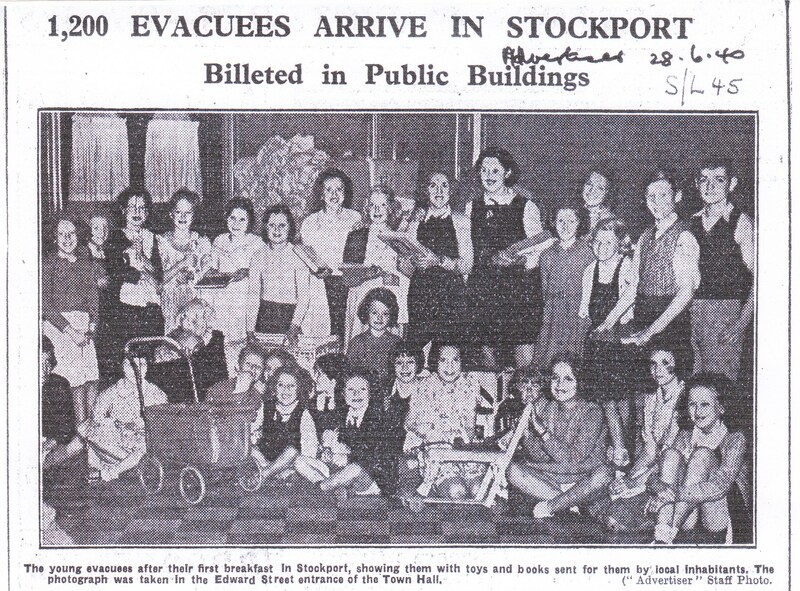 Her two children were evacuated with their school to Stockport in June, and are both quite ill in Stockport Infirmary. An aunt suspects that Mrs Bienvenu managed to get onto an evacuation boat the day after her children left, but no one knows where she has ended up. It is felt that she must be found so that she can be advised of the condition of her children, and can visit them. Mrs Batiste has a cousin in Oldham who is searching there too. It is most worrying – people arrived here from our island and were scattered throughout Northern England -and there are no proper records of anyone’s location. Our efforts have been rewarded and Mrs Bienvenu has been found! The local paper printed the story and this was picked up by a national newspaper. Mrs Bienvenu read about her children and was given a free travel pass to come to Stockport to visit her sick children. 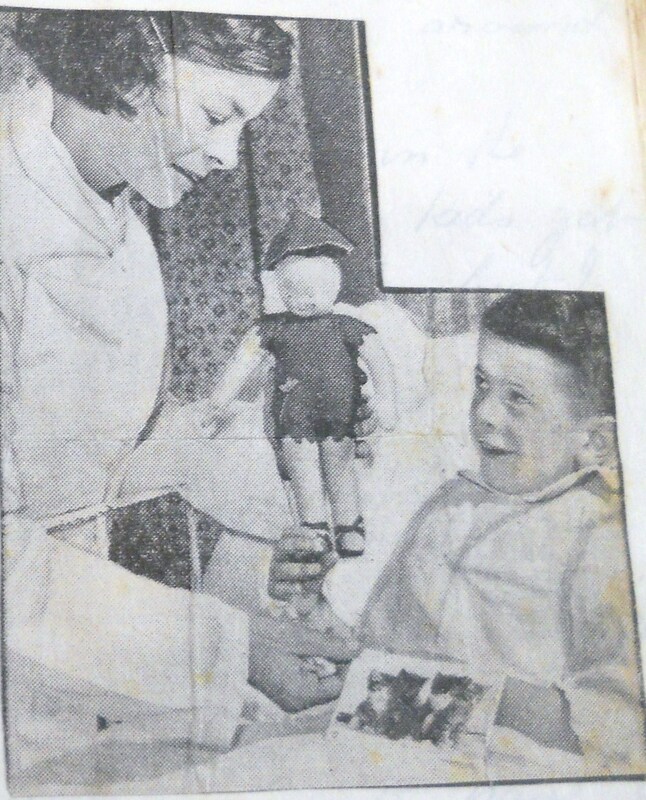 The local paper took a photograph of Mrs B at the bedside of her son, and he appears to be recovering as does his sister. A happy ending to the story. Once the children are well they can all be properly reunited and live together once again. I have had to work extra shifts at the factory these past few days, and have had no time to spend writing my diary. Last evening I accompanied a group of our Guernsey and Jersey evacuee children on a carol-singing expedition around the area, to raise some money for the evacuee fund. We collected quite a lot of money, but a notable feature was that at one residence, our singing was not appreciated: the bedroom window suddenly flew open and the contents of a chamber pot was emptied in our direction! Fortunately we were not standing directly in the line of fire! Wonderful news! We can at last write to our loved ones in Guernsey via The British Red Cross! Mrs Batiste and I visited The local Red Cross office this morning in Stockport and each sent a ten word message to Guernsey. It was very difficult to try and choose the most meaningful ten words, but after a great deal of thought, I wrote to my dear husband “Safe in Stockport. Nice home. Miss you. Write back soon”. How long it will take to receive a reply is not known as the letters have to travel through Europe before they reach Guernsey and they will be censored along the route by the German authorities. I met Mr Martel today, and he said that he has just sent a Red Cross letter to a friend in Guernsey. The letter states that all the children of Guernsey’s Forest School are safe and well in England. Mr Martel’s friend can then pass this good news on to all the parents of those pupils, which will be very reassuring to them. I wonder how long it will take for the letters to reach Guernsey? The wait will be agonising but at least we have now some form of communication with our island home. I have not had a minute to call my own lately, as we were required to work double shifts at the aircraft factory. I am exhausted and have spent scarcely a moment with my children in this run up to Christmas. This morning I queued at the butcher’s shop for almost an hour, but managed to come away with a rabbit and some sausages. These will form our household’s Christmas day dinner. I cannot complain about this, as others are suffering more than ourselves during this war. Those trapped in Guernsey under German occupation must surely be suffering too. What a wonderful day it was for our Guernsey children yesterday! 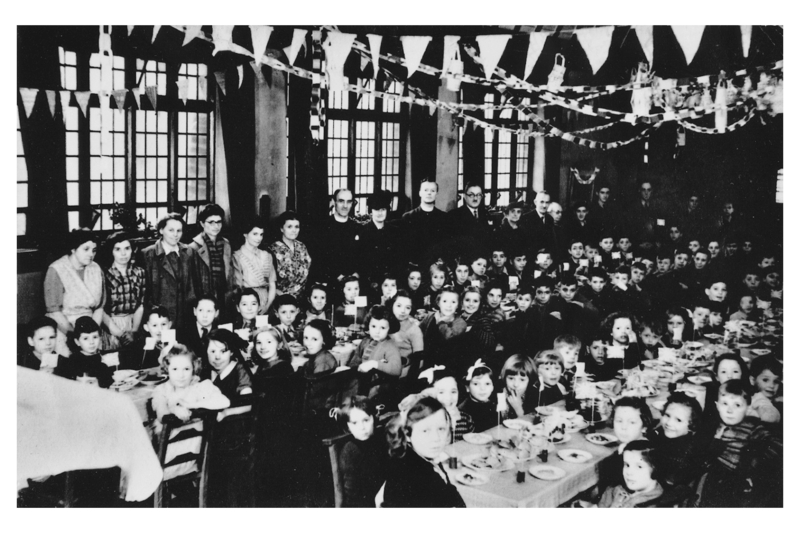 a large number of them were treated to little Christmas tea parties by the WVS and the local councils! 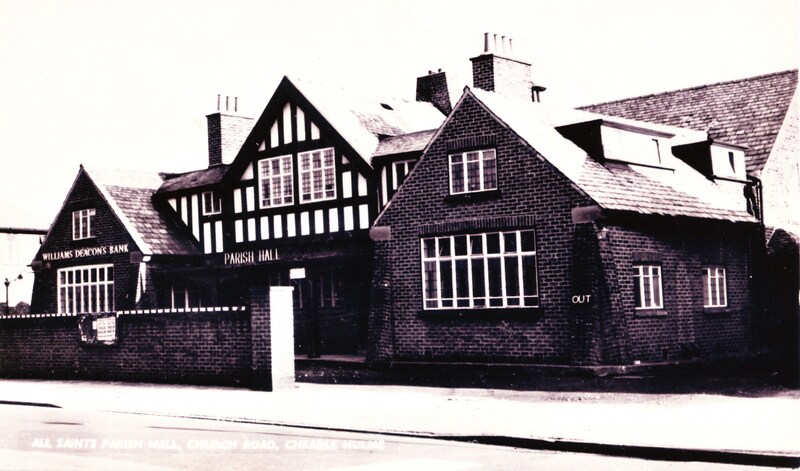 At Cheadle Hulme, Mr Martel’s pupils had sausages, lemonade, jelly and ice cream- they also received a small gift each from the kind ladies of Cheadle WVS. It was wonderful to see their smiling little faces at the end of the party when we went to collect them to bring them home. However, many were reminded of their fathers back in Guernsey and asked us “When will we see Daddy? will he be coming to England for Christmas?” which causes a few tears to be shed by we mothers. I thought I would take the time to write something of our first Christmas spent away from our island. Our Christmas Day was pleasant, although we all missed the presence of my husband and Mr Batiste. Mrs Perrier joined us for a bite to eat, as she wanted her children to have some sort of memorable Christmas and we managed to stretch out our Christmas meal with everyone. 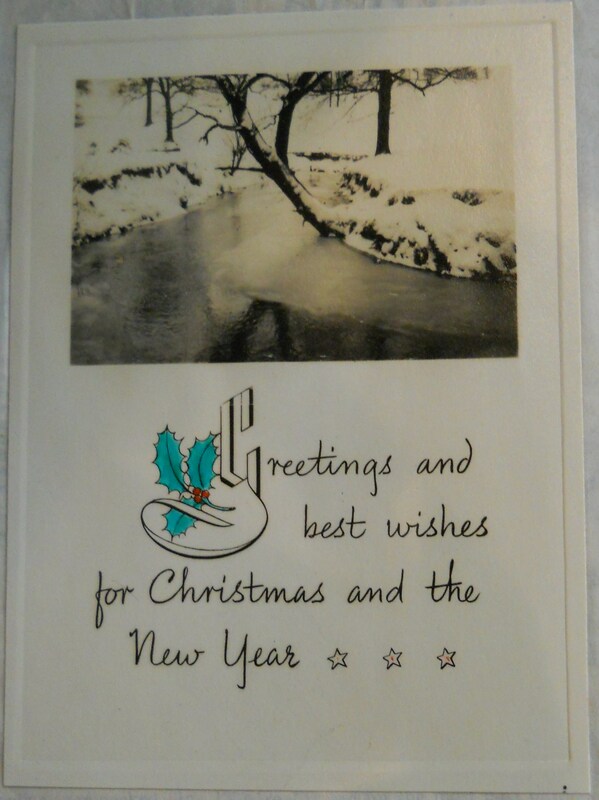 Everyone appreciated the Christmas cards that I had made out of scraps, and we said a prayer at the start of our meal for our loved ones who are are in Guernsey under German occupation. Yesterday a group of us Guernsey mothers met up for tea and biscuits at Mrs Alexandre’s home, where we chatted about our experiences of Christmas in England. Mrs Croker broke our hearts when she told us that she and her two children are billeted in the attic of a nearby house. The family who own the house ate a huge Christmas dinner, but did not think to include Mrs A and her two infants. Mrs A and the children spent the whole of Christmas day in their attic room with soup and bread, and no presents or cards. Mr Martel called today to tell us news of the bombings in Manchester over the Christmas period. Many buildings were razed to the ground, and a friend who had been visiting relatives in central Manchester had to hide in a cellar for 13 hours. Blazing debris had fallen upon the cellar exit and he had to be rescued by firemen. One of the firemen who rescued him was actually a Guernsey man who had joined the fire service a few months beforehand. We have been lucky here not to be bombed, although I understand that a Guernsey family living in Cheshire saw a German plane dropping its unused bombs on a field on its way back to Germany. New Years Eve approaches, and some of us mothers plan to gather together to mark the end of 1940. I will make a blancmange and some brawn to contribute to the feast which will take place at our local church hall. I plan to take my children and Mrs Batiste’s children to the cinema tomorrow evening, after my afternoon shift, for a treat – my old employer told me to bring them in free of charge, which is very kind of him. I worked my shift today and then took the children to see ‘The Gold Rush’ film starring Charlie Chaplin. They really enjoyed themselves and it was such a treat that they could see the film for free due to the generosity of my old employer! When we left the cinema to walk home, the smog and fog had descended upon Stockport with a vengeance and we had great difficulty finding our way home. We all held hands and felt along the walls and for the edges of the pavements. A bus suddenly appeared out of the gloom as we crossed Wellington Road which came as quite a shock to us as the sound of its engine was muffled by the thick fog! We were glad to get home to a cup of tea and then bed. As I sit and write this last entry of my 1940 diary, the children are playing quietly downstairs with Mrs Batiste’s children. I have had no news of my husband in occupied Guernsey since we left there in June, but God willing, I hope to have a reply to my Red Cross message in the new year. Later today we Guernsey mothers and children will gather at the church hall for a tea party and games. We will give God thanks that we are all together on this day, safe and sound. We will pray for our families in Guernsey, hoping that 1941 will bring relief to them and us with the end of this foul war. We will also pray for the removal of the Nazis from our island home, and for our rapid return to our island and our loved ones there! Fabulous post. Enlightening and incredibly interesting. I can’t find your ‘follow’ button though! Normally I do not read article on blogs, however I would like to say that this write-up very compelled me to take a look at and do so! Your writing style has been surprised me. Thanks, quite great post. Your Diary is a really interesting piece of first source history. Diaries of this type bring the history of ordinary, AND extraordinary people to life. I have also been reading accounts of the brave Channel Island people who sheltered Jewish people and slave workers. THEY are the people who deserve knighthoods – not the celebrities! My grandsons are ‘Jersey Beans’,, living in St Lawrence, and I am collating a history of the Channel Islands in WW2 for them as they are so interested. Would you mind if I copied parts of your diary to include in the folder? I was also born in Manchester (1942) though not evacuated. It was only recently that I found out about the Guernsey evacuation specifically to the North West of England. Amazing that they had just evacuated children from that area to the countryside and then place the poor Guernsey children in harm’s way. Awful too to read that some were taking in children ‘for the billeting money’. I live in Suffolk now but always remember the people of the North West, especially Manchester, as being so warm and friendly to everyone. There’s always one bad apple etc…! Hoping you can manage to reply with your permission. I will certainly buy your book. Sorry this is short but I am reaching the publishers deadline for my book and dare not stop writing! Hi Gill, I was wondering if you had heard about a new facebook page that’s sprung up about Guernsey. It’s a spontaneous and fascinating exercise in oral history using social media. In less than 2 weeks the site has collected almost 11,000 members. Guernsey people of every generation are commenting and there are many first hand posts about the Occupation and Evacuation. A wealth of private photographs and memories of the war years are popping up amongst more recent Island history. The page is called “Guernsey Days Gone By”. It’ll take a bit of patience to trawl through for relevant posts, but as a researcher I expect that will be something you enjoy. I apologise if you’ve already had news of the page, I just couldn’t resist popping a link to this blog on the page. Hi Karen this is very kind of you as I have not heard of this page. I was on Facebook (and my page is stil there) but I dont use it any more as I was followed by some very strange people. I will see if I can access the facebook link you mention next week when I am home. Thank you so much for your help. I really enjoyed the exerpt…and look forward to reading the book.I had never heard of Gurnsey until I read the book The Gurnsey Literary and Potato Peel Pie Society which I thoroughly enjoyed. Going to Amazon now! I saw on Twitter that Peter St. John was in this book. I can’t find that part. I am a reading fan and friend of his. Is his story in this book? I am shocked if he has shared his private thoughts. Anyways, very interesting! 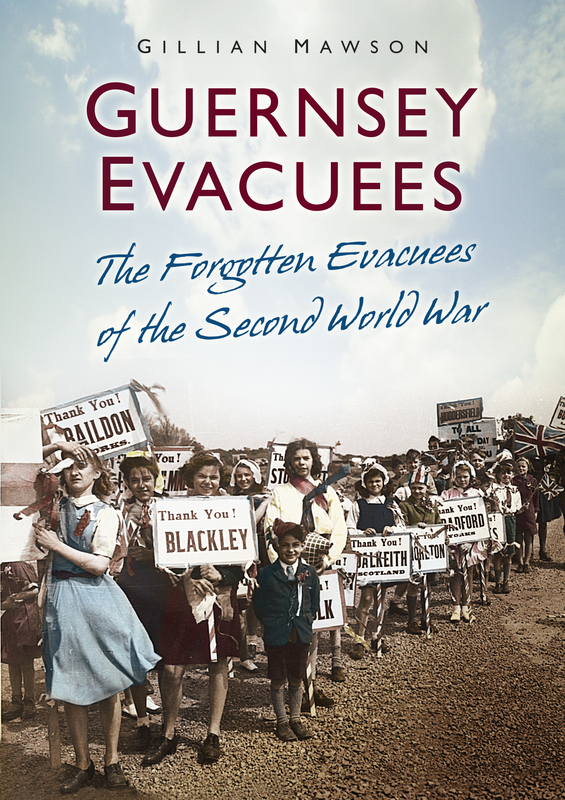 Hi Gill, I have been reading these stories of the evacuees from Guernsey. I think our experience of being evacuated into the country in England, for some of us anyway ! Is nothing compared to the Guernsey evacuees. They must have been terrified. I have to say that the comment ‘The smiles on the faces of the children was a sight to see’ doesn’t square with the photo. The poor kids look as though they’re still in shock – as they might well be.